From flower power to the Brady Bunch, the 60's and 70's gave us memorable moments and artistry that changed the world. 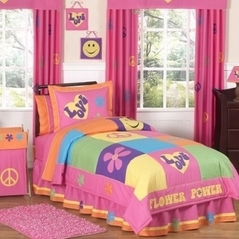 And now with our Groovy Childrens Bedding collection you can bring the message of love and peace into your child's bedroom. From hip and stylish Tie Dye prints to the internationally known peace symbol, our Groovy Bedding sets are sure to turn any drab room into a colorful expression. And for even more ideas, please visit our pink and brown childrens bedding and childrens animal bedding sections.